Robot-based assistance systems are taking on a large number of tasks in the manufacturing industry. Thereby, they are acting more and more autonomously and are also able to work directly with humans in applications of human-robot collaboration. This creates a hazard potential for humans, which is influenced by human factors. In this regard, Situation Awareness (SA) will play an important role. SA is a construct to map the ongoing mental processes of a person interacting with a complex situation. This paper describes the conception of a full-scope simulator as a model of such a system in an experimental environment. Different environmental influences can be created and reproduced in the simulator. With this simulation, disorders and possibilities of attentional control, conclusions about the situational awareness of the probands are expected to be considered. The simulation is completely autonomous and allows an experimental design with several probands. The simulator will also allow comprehensible and repeatable scientific experiments based on the SAGAT method. In this publication is presented a method for design of an operating station based on a TCL / TK – portable open source programmed platform, implemented for different operating systems (Windows, Unix, Linux, Solaris, Android). (3) “Multi- threads" mode, including cooperative working of one or more program threads. The described approaches are illustrated by presented implementation of an operating station to wireless control system for a group of intelligent instruments which are designed for laparoscopic surgery. In this research, with the installation of Sigfox’s antenna in our university, we installed IoT equipment that makes use of the Sigfox network. As an example of an IoT device, we tried installing it on a water meter to acquire data, such as water usage fee, via internet. Also, using the system outline, we constructed it as an educational system. The research part of the survey includes defining and determination the transport capacity in transportation graph where the potential of railway and bus transport in Bulgaria is rated. This research is focus on advanced modelling and design of complex interconnected processes. These processes are characterized by multiple inputs, outputs and state parameters as well as non-linearity, non–stationarity and uncertainty due to environmental disturbances. There are presented two models for deep learning and knowledge extraction using methods of multivalued logical and probable functions and networks model. These models can be applied for complex processes in the area of environment, transportation and complex systems working under uncertainty. With the majority of the world’s population now living in cities, the importance of distributed transport systems integration is increasing. This requires improved integrated transport infrastructures and communication within cities to reduce the cost of congestion on the roads, provide an efficient and convenient system for travelers and improve the management and future planning of public transport within cities. By sharing large amounts of transport data with the public, including automatic passenger counting information, pollution and traffic congestion can be managed to better levels and subsequently lead to improved overall public transport services. The present paper aims at arguing the growing dependence of the efficient urban transport on the new technologies. The growing demand for cloud computing together with Internet of Things is based on the numerous advantages going along with this technology, provided that it is used appropriately. Cloud Computing is a revolution that will define Information Technology in the second decade of the 21st Century. being made in Japan. For example, concerned Japanese cabinet members agreed on a ‘ Hydrogen basic strategy ‘ on Dec. 26 2017. This strategy, with a view to 2050, shows direction and vision toward the realization of a hydrogen society and compiles an action plan to achieve that goal. It aims to scale up hydrogen consumption volume from 0.4 ten thousand t (2020) to 30 ten thousand t (2030) and deduct the unit price of hydrogen from ￥100Nm3 (now) to ￥30Nm3 (2030).We will also try to construct a preliminary autonomous energy system using regenerative energy. In this paper, the operation and function of such a system is described. An intravascular stent is a tubular structure intended for permanent implant in native or graft vasculature. The stent is designed to provide mechanical radial support after deployment. This support is meant to enhance vessel patency over the life of the device. In this work an approach for designing the geometry and construction of slotted-tube balloon-extendable stent, produced by Nd3+:YAG laser cutting from stainless steel 316L tube is proposed. 3D model of the stent, produced by ISMA Ltd, Sofia, is prepared by using SolidWorks. FEM analysis of the stent is performed and the mechanical properties are compared with variety of commercial stents. This paper describes the development of a simulation model. The model deals with the role of assembly worker in the virtual environment with an emphasis on ergonomics and time analysis. Firstly, we analyse time reports of common tasks in manufacturing processes like reaching, lifting etc. We receive time reports from three different methods: analytical MTM method, Siemens JACK 8.4 simulation and practical experiment. Secondly, we look into influential parameters, dimensions and mass of object, which affect the time reports. The results of our research show us that the parameters have different weight of importance. The main goal of this paper is to propose suggestions and guidelines for a worker-friendly environment from an automated generated ergonomic report of JACK simulation. We also ergonomically evaluate the task of lifting with the NIOSH method and propose improvements. The paper presents some of the results, obtained during the research on scientific project at TU-Sofia № 171ПР0012-06 “Research on the influence of using raster image processors (RIP) on the quality of color printing of digital proofing systems“. The purpose of the paper is to present a research on the quality of color printing of and toner based printer using custom generated ICC profiles. Before the current research, the printer is properly adjusted, calibrated and linearized according to the method published in previous research of the author. The generated profiles are then thoroughly tested and analyzed using specialized software. Their color gamut is compared to the standard offset gamut. The color rendering of the profiles is evaluated through testing and a general conclusion of the benefits of the process is provided. 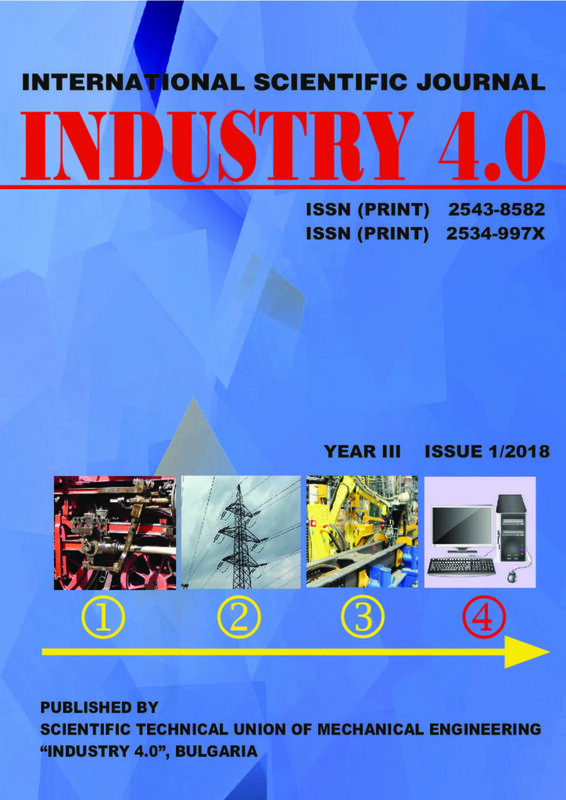 The article discusses the importance of information support of marketing activity for industrial enterprises implementing the concept of relationship marketing. The authors analyzed the model of the marketing mix «4C» and «4R» as the most efficient for the relationships with customers. The structure of data flows in the implementation of the «4C» and «4R» models of the marketing mix is presented. It is developed a set of action for the tools included in the model «4R» for the Russian company – the manufacturer profile of polyvinyl chloride construction items. It is concluded that effective information system of management for relationship marketing in the industrial market will maintain a long-term relationship with partners by the creating and supporting a close relevance between the enterpriseand customers. Port logistics is a vital element of international shipping and logistics management. The type and scope of port management influences the overall functioning of the international supply chains. Modern approaches for supply chain management, efficient business processes control and information exchange, based on advanced technology, are to be considered synchronously. The present article analyses the organization of port management processes, its components and the information flows with business stakeholders. The proposed conceptual model aims at improvement of port management performance in terms of logistics management, integration and mainstreaming of business processes. The high level of investment for the international energy, transport and infrastructure projects, in almost all cases need of a multi-source approach of financing is necessary, having the European funds as a main component. Each such project must be undoubtable innovative and in accordance with the safety and environmental European requirements. The Legal Entity (LE) is a key factor, acting for coordination of the management and for legal responsibility during the all phases of the project. Choose of the most appropriate type of LE for realisation of such project has very high priority in the whole investment process. In favour of this the report presents the main types of European Legal Entities with their advantages, disadvantages, tax issues, intellectual property rights (IPR), etc. The state administration is a part of every government and it is responsible for the implementation of certain administrative, legal and regulatory functions. An effective functioning of the state administration eases the functioning of the citizens and the business and therefore the processing in it is approached as a business process. There are certain similarities and respective differences between a business and an administrative process. In this paper an introduction into the problem is made.